Note: This tutorial was originally published in a blog post on October 19, 2017. You can visit the original post, here. 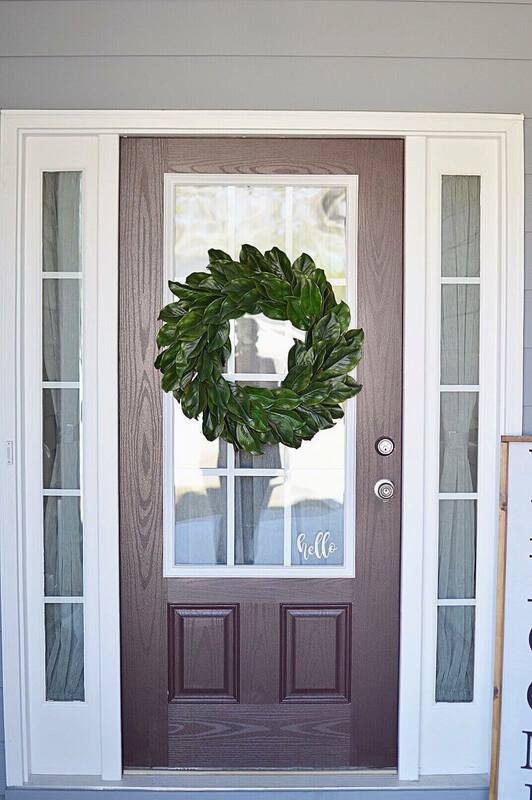 When it comes to your front door, I almost don’t think it’s complete without a wreath. I’ve made a lot of wreaths over the past 6+ years for all seasons, but my favorite one has to be this simple yet darling magnolia wreath I made for our new house back in the fall. Every time I share a photo of the wreath, I still get so many questions about where I got it. Not to mention, when people come to find out how I made it, they almost can’t believe how easy (and inexpensive!) it was. 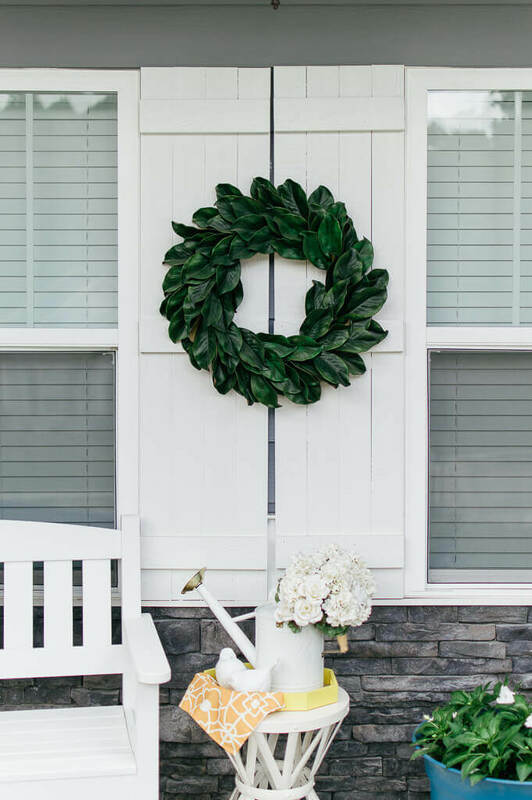 Meanwhile, I shared our farmhouse front porch inspiration last week on the blog featuring our wreath. 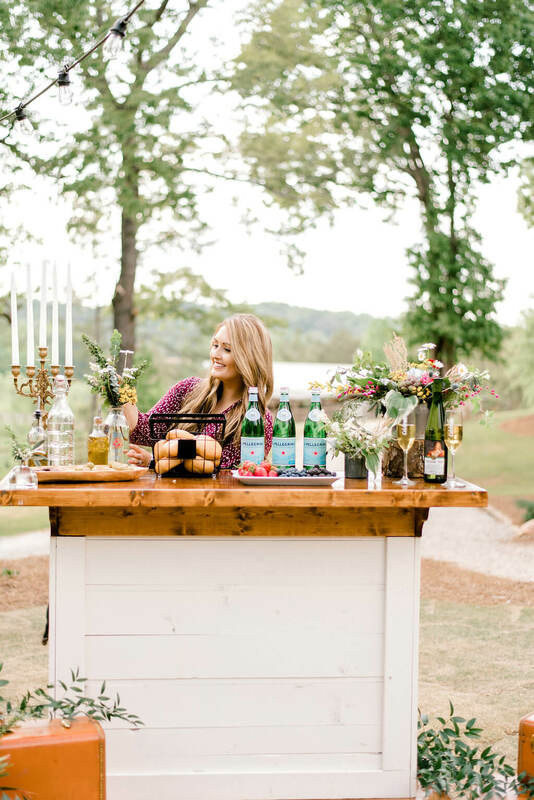 With summer officially in full swing and everyone preparing their outdoor spaces for the sunshine ahead, I thought I’d share an updated tutorial on how you can easily get the look for yourself! I must say, I think the magnolia wreath turned out super cute – and, dare I say, better than the ones you’d buy in store! The leaves are a lot more glossy in the photos than in person thanks to my late night dining room table lighting. Constructing the wreath was actually super easy and took me less than an hour to do. In fact, I did it while watching a Texas A&M football game one weekend this past fall. The best part? I only spent about $30 total on the supplies without the 40% off coupon. I didn’t use scissors for this project at all. I just pulled off the leaf groupings from the main bush/stem. You definitely want to have enough stem to tape to the frame. Not to mention, towards the end you’re going to need some length to touch up and stick in your final groupings. To get started, you’ll lay it on the frame and wrap the tape around the whole frame. (See below.) I just did about 2 inch sections the entire time. Try to wrap it as tight as you can without the tape breaking in order to keep all the groupings in place while you work. 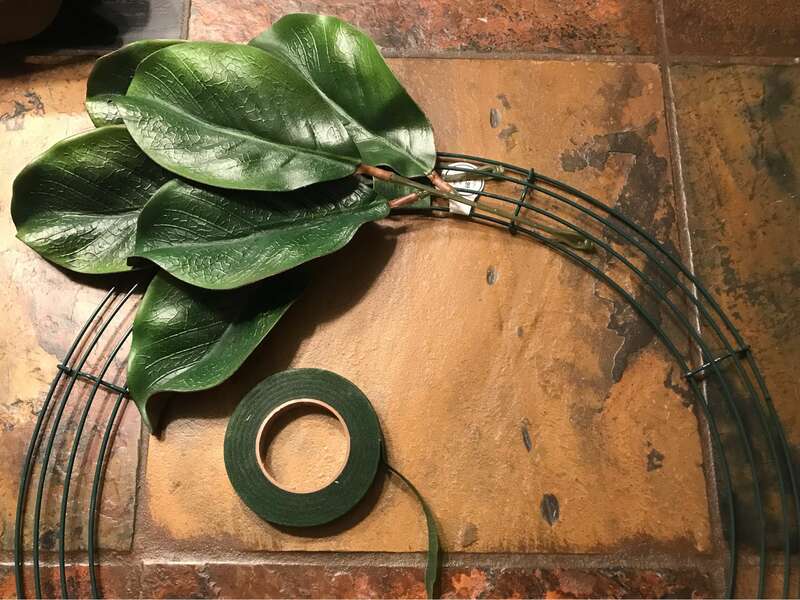 Basically for this entire project, you’re going to be repeating Step 1 over and over until you have worked all the way around the wreath frame. With the first grouping placed perpendicular to the wreath frame, I then alternated angling the groupings up and down in order to get a full look that had a lot of coverage. Place the next grouping on top of the first with the lower two leaves of the grouping about halfway down the first. 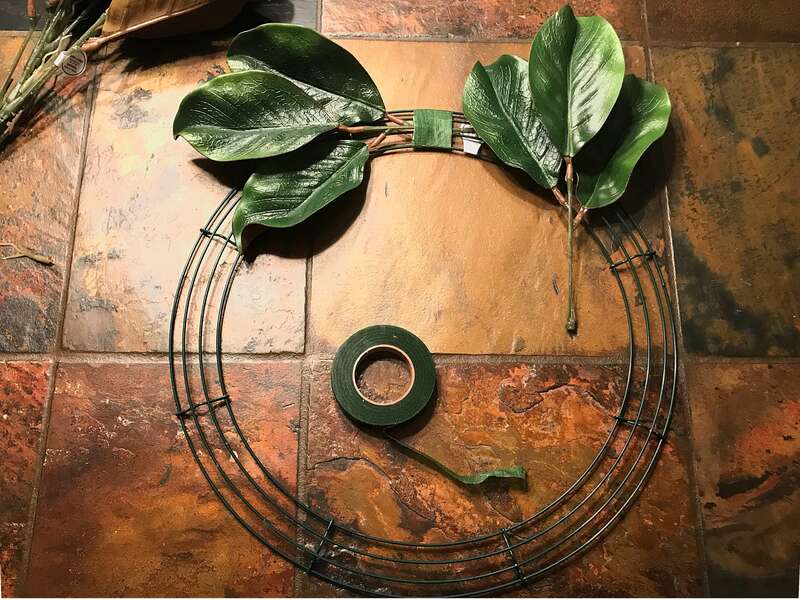 You’re going to want all of your leaves pointing the same direction, so continue to work around the wreath frame until you are back where you started. For the last few groupings, you’ll have to tuck the groupings behind the first to make sure you get a cohesive look. 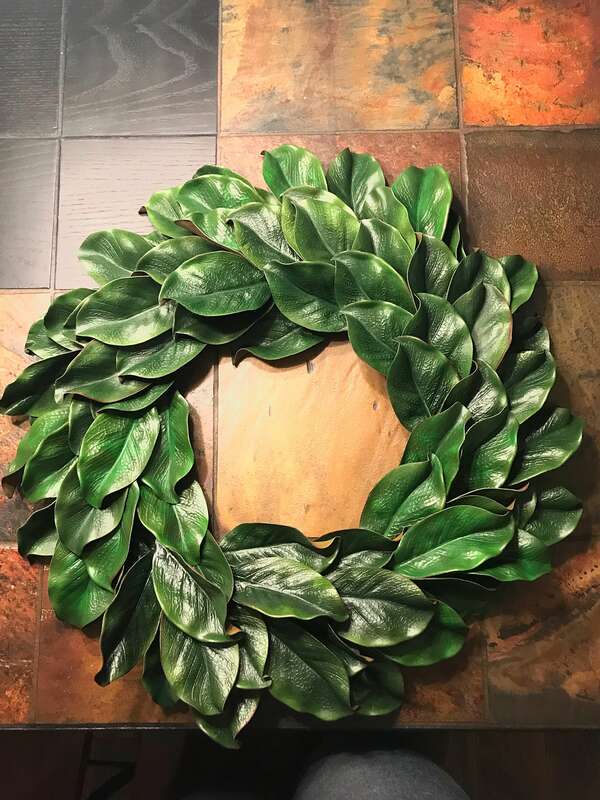 I had the perfect amount of leaves to make this wreath with no left-over. I have not had an issue with the floral tape leaving a sticky residue on our door. Seven months later, I also have not had an issue with the tape coming undone or leaves falling off. 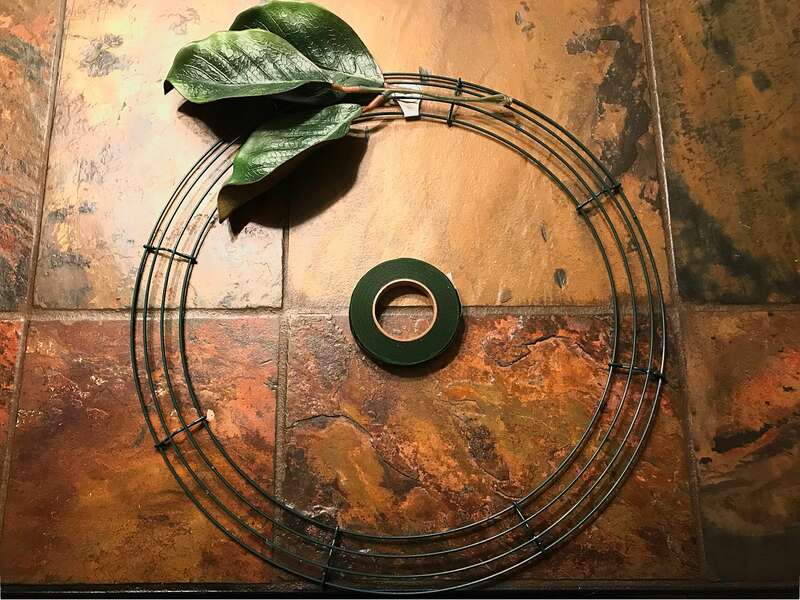 I hung the wreath on a command hook in a small gap between two tape groupings. If you’re still worried about the tape leaving residue on your front door, you can easily put clear scotch tape on the back as an extra measure. It has been about 7 months since the I made our magnolia wreath and published the tutorial on the blog, and as you can see it has held up extremely well! It still looks practically brand new, and it is showing no signs of wear and tear at all. For a $30 DIY, how can you beat that? I still get so many compliments on it each and every time someone comes to my door. 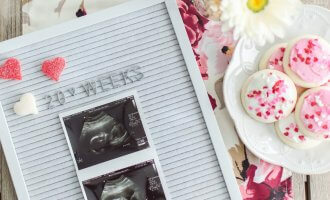 I can’t wait to make more of them for around the house! 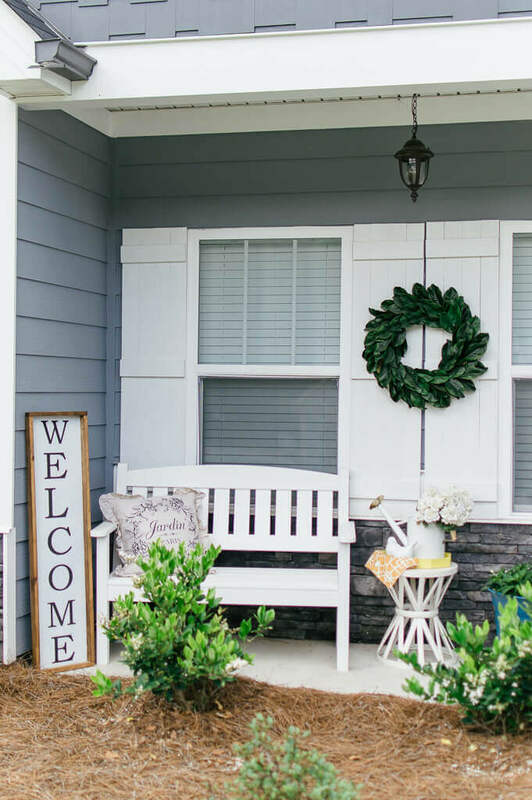 You can see recent photos of our magnolia wreath in our recent post highlighting our front porch decor for summer, here. 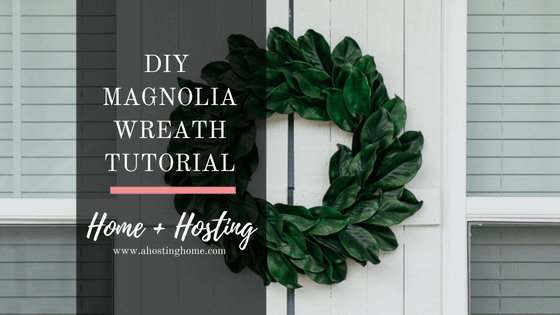 I hope you enjoyed this super easy and quick Magnolia Wreath DIY. Comment below with what you think of the finished product! Also, if you try it for yourself, I’d love to hear how yours turned out. Share your wreath images on social media and tag myself (@thecathynugent) or A Hosting Home (@ahostinghome) on Instagram! The wreath is absolutely gorgeous! I need one for my door! 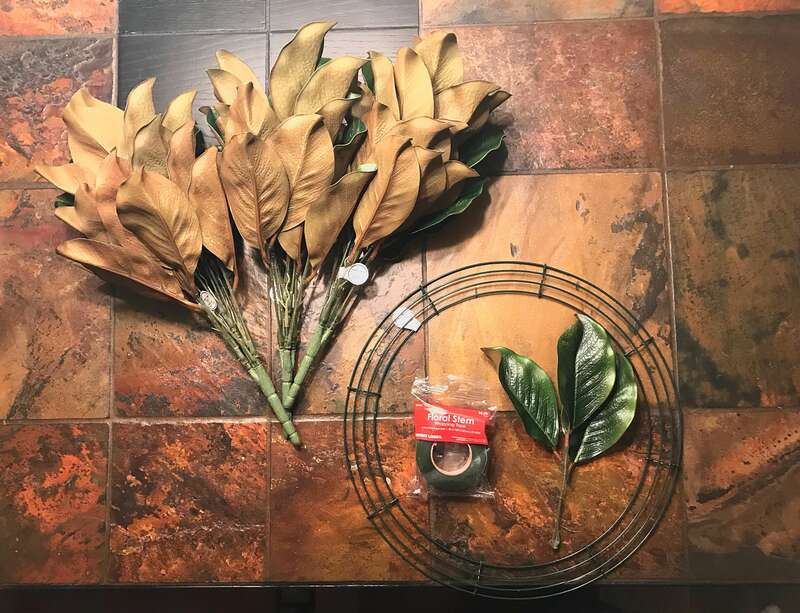 Magnolia wreaths are so expensive – I never thought to make my own!! Oh wow, this is really beautiful! 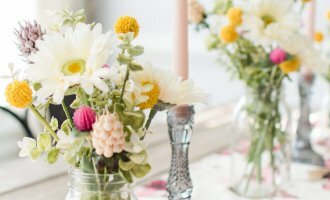 I would never think to make a summer wreath! OH THAT’S SO CUTE! AND LOOKS JUST AS GOOD AS THE ONES IN THE STORES! The magnolia wreath has turned out perfect. it is quite easy. my daughter will love it. This is adorable! 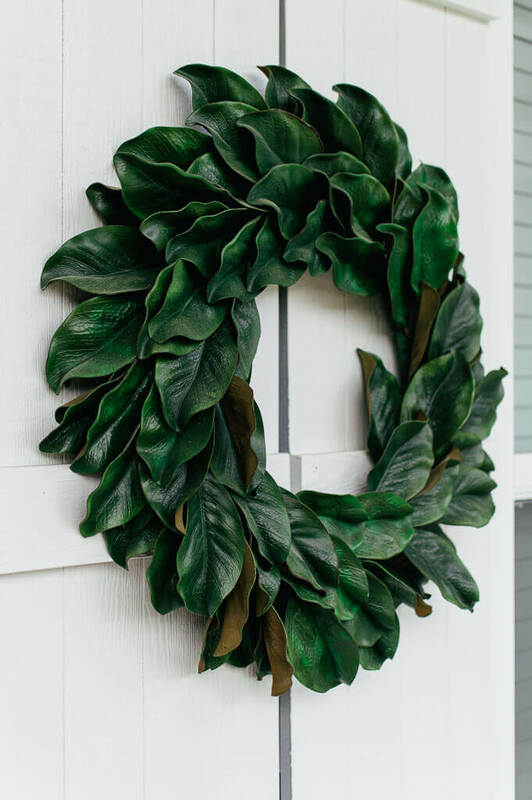 Magnolia Wreaths can be so expensive and this one is perfect and such a great price. Bookmarking this page!! 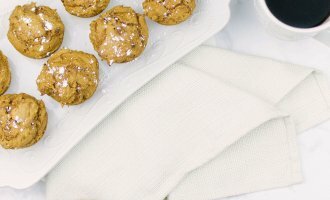 This looks super easy and it’s so pretty! Love this wreath, so pretty! I want to try and make it for my door, it looks easy enough even though I am so bad at anything crafty. 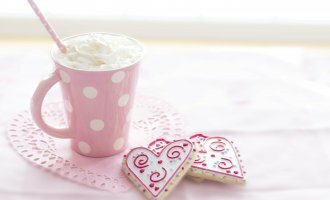 I love how pretty and simple it looks, but also super easy to make. I used to make wreaths for different seasons, but I stopped for some reason. Time to head over to hobby lobby!